In this enquiry you will examine In the case of options 3A, 3B and 3C, the specified historical content provides the context for the enquiry. The context for the fourth option, 3D, is the knowledge and understanding of a wide range of historical sources and how they are used in different types of historical enquiry. In all four options, the focus of the paper is on the skills involved in using sources, separately and in combination, in their context, rather than on simple recall of the historical content of the unit. The key features of each enquiry are summarised in bullet points. The features are amplified in the text beneath. • This unit is assessed through a 1-hour and 15-minute examination. • The paper will have six to eight sources and students must answer five questions. • There are 50 marks available for this paper. 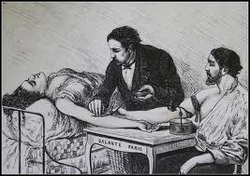 An understanding of the way surgery was perceived before anaesthetics were available. Developments in dealing with the three main problems in surgery: pain, infection and blood loss. An understanding of the main factors influencing these changes, including; he role of science and technology; war; communications. Science and technology: the impact of Pasteur’s Germ Theory (although questions will not be set directly on Pasteur’s work), the discovery of x-rays and improvements in knowledge and the development of equipment. The effects of war on injuries and as a catalyst for developments. 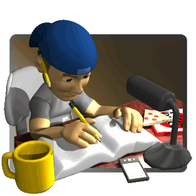 Communications: reporting and sharing advances, the influence of reports on medical and public opinion. Focus 1. 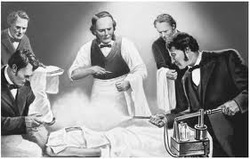 The development of Anaesthetics. Dealing with the problem of Pain. In this enquiry you will examine dealing with the problem of pain. Developments in anaesthetics; the work of Simpson. 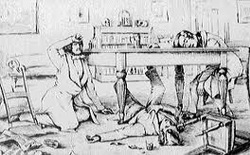 The use of nitrous oxide, ether and chloroform; the importance of Simpson’s work; opposition to anaesthetics and why improvements in anaesthetics led to the ‘Black Period’ of surgery. Focus 2. The development of Antiseptics. Dealing with the problem of Infection. In this enquiry you will examine dealing with the problem of infection. Battle against infection, developments in antiseptics; the work of Lister. The battle against infection, the importance of Lister’s work, opposition to Lister’s ideas, the move from antiseptic to aseptic surgery. Focus 3. The development of Blood transfusion. Dealing with the problem of Blood loss. In this enquiry you will examine dealing with the problem of blood loss. Blood types, blood banks, transfusions. The problem of blood loss and ‘shock’, the work of Landsteiner in establishing blood types and the development of techniques to store blood.